We didn’t really have a winter this year. I saw snow only one evening, on my walk home from K’s studio apartment. Even though snow always causes many transportation problems in the city, feeling those first snowflakes fall on my cold nose made me feel a little bit happy. In my mind, I was already imagining the white landscapes I could photograph. But the next morning, there was not a single clue that it had snowed and through December, January and February no more snow came. Today is the first day of Spring, and I decided to write a small post about why I love this season so much. After pointing out all the reasons I hate fall last year, I have something to make up for. Spring break. No explanation needed. It is also Barbecue season again! Blossoms, and lots of them. The after-Easter chocolate coma. I already can’t wait! Taking outfit pictures, because golden hour is baaaack! Watching the night fall on top of the MAS museum. My Jo Malone Pink Peonies perfume fits the season perfectly. Taking a magazine (preferably InStyle) and my camera and enjoy the sunshine on a bench in the botanical garden. Maybe with a frozen yoghurt. No… definitely with a frozen yogurt! And a BBQ afterwards. Ik heb gisteren m’n eerste bbq gedaan, hip hoi! Barbecues!!! They’re my absolute favourite, so I’m stupidly excited for those haha 🙂 I’m so excited about spring too – and seeing all the pretty flowers popping up everywhere, and the trees are finally growing some leaves 🙂 No more naked trees hahaha! You are fortunate you did not have a rough winter, I can say I had to deal with a lot more snow than I wanted! I can not wait for spring blossoms, eating ice cream everyday, and spending time outside! These are a lot of good reasons for being in love with spring!!! Have a nice weekend, Nikki! BBQing!!! Yessss. I really want to try Daisy perfume (I think that’s the name.) 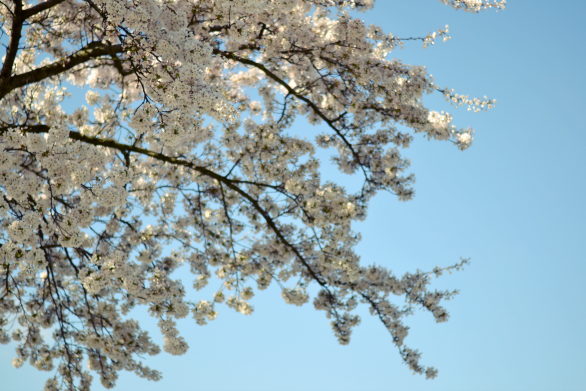 Also, blossoming trees and flowers – swoon! I’m not a big fan of BBQ nor do I have a garden, but I am looking forward to BBQing haha.. it’s the sun.. it makes life pleasant 🙂 enjoy! Die pink peonies ruikt ook echt zo zo zo lekker!!!! mother nature decided to give us all of your snow. We got so much this year!! I am so ready for spring! Yes yes yes frozen yoghurt. In Antwerpen op 5 min van mijn stageplek, die klantenkaart is alweer bijna vol, oeps! 😀 En ik ben al druk BBQ’s aan het plannen, ohja, nooit te vroeg daarvoor! Oei, op 5 minuten? Dat is gevaarlijk!